The Centennial Trail begins at Nine Mile Recreation Area, 15 miles northwest of Spokane’s city center. It hits Nine Mile Falls, Bowl and Pitcher, and Deep Creek Canyon, then downtown Spokane. 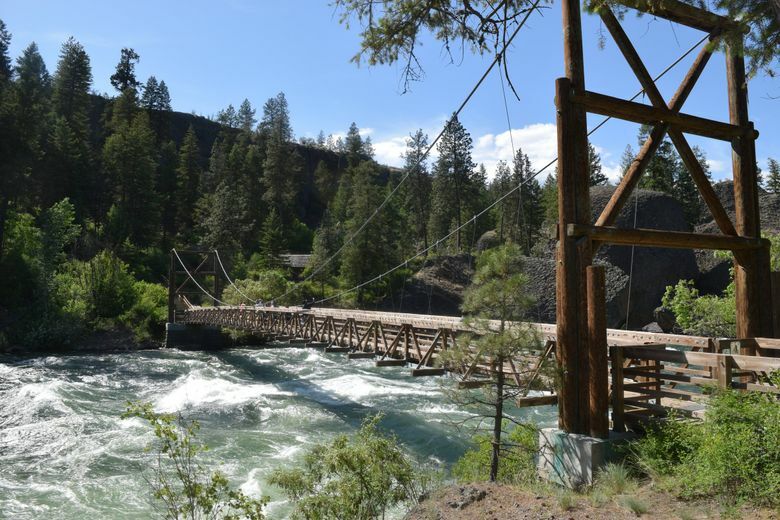 The spring flow rushed incredibly, translucent turquoise and capped with foam, making the sturdy suspension bridge over the Spokane River seem slightly less secure underfoot. We pushed our bikes across, then up a set of wooden steps. The trail took us north from Bowl and Pitcher Campground toward Nine Mile Falls. 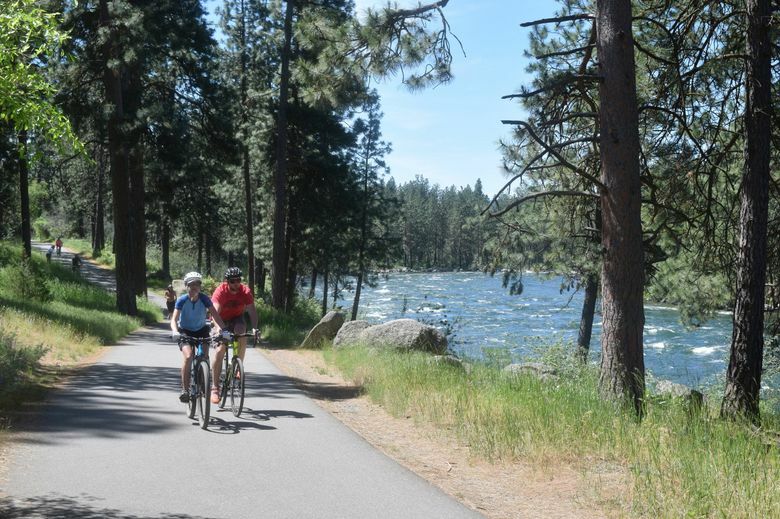 Exploring the Spokane Centennial Trail from end to end meant first relaxing at the comfortable Riverside State Park campground, situated in an open ponderosa pine forest on the west edge of the city. After reconnoitering the west end and returning, we’d be going east through Spokane and into the valley, then on to Idaho over a connecting trail that would take us to the resort town of Coeur d’Alene, and a bit beyond. We’d traversed a half-mile of packed earth with spots of loose gravel before reaching the paved Centennial Trail. At that point, we were high above the river, and parallel to it. Along with a stunning view of the rushing river and the hills beyond, the asphalt trail provided a smooth path, with few other users or road crossings. Occasional mountain bike and hiking trails intersected the route. A series of rolling hills promised assistance with any cardio goals. The Centennial Trail begins at Nine Mile Recreation Area, 15 miles northwest of Spokane’s city center. It skirts scenic Nine Mile Falls and then Bowl and Pitcher before plunging into Deep Creek Canyon for the most challenging cycling, then into downtown Spokane and east, where the riding is easy on a flat — if slightly rising — grade. Already warm in late spring, the sun had us searching for a shady break, which we found under big leaf maples at the historic cottages at Nine Mile Falls. A water fountain and lush green grass beckoned us to relax outside the row of brick worker housing in this former power-company town. The impressive falls tamed the wild river and lit up the area, hydropower-style. Craggy gray basalt towers loomed over the canyon and shaded the hillside opposite. High on the rock, a climber in a red shirt picked his way up the mounds. The trail flattens into Downriver Park, then crosses the river and hugs the east bank, intersecting with the streets of the West Central neighborhood. 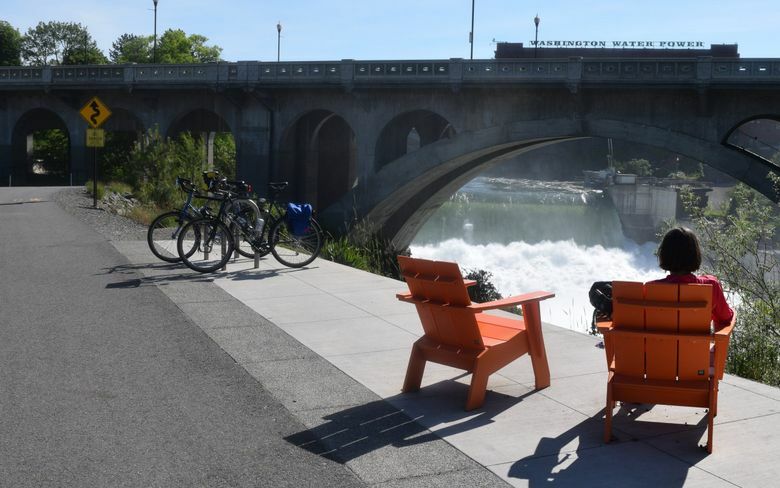 We entered downtown’s extensive Riverfront Park by cycling under Monroe Street, where a stunning view of the largest of three Spokane Falls rapids — and its accompanying spray — woke us up. Home to those falls and the 1974 World’s Fair, Riverfront is getting a major face-lift, its first in 40 years. The expo’s last remaining structure — the iconic U.S. pavilion, with its arching, inverted-funnel shape — is being re-imagined. Until the work is completed in 2019, riders can skirt the construction fencing along broad, flower-lined paths that link old with new. The meandering park trails are a treat. Exit downtown past the performing arts and convention centers, then Washington State University’s Spokane campus. Another bridge lifts cyclists across to the Gonzaga University campus, which soon gives way to Upriver Drive and a bike lane along the trail that leads out of town through residential developments. An oasis before departing the city comes at the crossing of North Argonne Road, where a quarter-mile detour whisks you to the Rocket Bakery, with great coffee, sandwiches and treats. Hungry locals keep the bakery busy, so consider a grab-and-go lunch. Take your picnic to a stop on the trail’s Spokane Valley section. Once the city development peters out, the flat and forested trail hugs the river’s edge. Approaching an exposed section along Interstate 90 near the border, trail traffic thins to nearly nothing. That’s a feature beloved by locals like Jennifer and Ryan Kennedy, who five years ago moved to Liberty Lake, a short spin from the trail. Coming from Redmond, a nexus of rail-trails for Seattleites, the pair was delighted to find their new route so wide open. “From a Seattle standpoint, it’s not crowded,” said Ryan. “People are friendly and courteous” — traits that the pair did not see often enough from bike groups and commuters on the Sammamish River or Burke-Gilman trails. Besides enjoying the perks of a less-populated area, the couple also lauded the amenities, including easy parking, frequent restrooms and a well-tended paved path. But mostly, said Jennifer, as they relaxed with their dogs and a picnic lunch, “it’s incredibly scenic.” She gestured at the surroundings. “From farmland to mountains to rivers to the lake.” That would be Lake Coeur d’Alene, the last stop on the trail. Before reaching the lake, though, you must pass into Idaho along I-90, 37 miles from Nine Mile Falls. Many will find the first Idaho section of the trail falls unfortunately short of the marketing, as it hugs the big highway into Post Falls. The trail veers onto quiet town streets, but if you want services, you’ll have to bike north across I-90 on Spokane Street to the town center. Another three miles parallel I-90 before entering Coeur d’Alene, at which point you bike to the source — the Spokane River emerges from Lake Coeur d’Alene alongside bustling lakefront tourism. On a sunny weekend, City Beach Park is thick with swimmers and slow-walking visitors, and best skirted. But the ice cream shops of Sherman Avenue (accessed at the big Coeur d’Alene Resort at 53 miles) might be worth the jostling. The center of this beautiful small city might be your destination — it is for most visitors. However, stop there and you’ll miss out on a stunning section of the trail, which continues another six miles to a dead-end at Higgins Point. The section puts the gentle lapping of the lake’s glittering waves at your feet. We persevered five miles further, to one of two campgrounds at the edge of Wolf Lodge Bay on the lake’s eastern edge. Exit the trail and pedal up winding Yellowstone Trail Road, enduring a section of gravel, and then drop to the camping access where Highway 97 intersects with I-90. Intrepid cyclists could continue along 97 to pick up the Trail of the Coeur d’Alenes at Harrison, but the 20-plus miles beyond Wolf Lodge are tough for cyclists. It’s a scenic road, but a busy one, and the winding two-lane has no shoulders. The route marks an unfortunate break in the trail system. 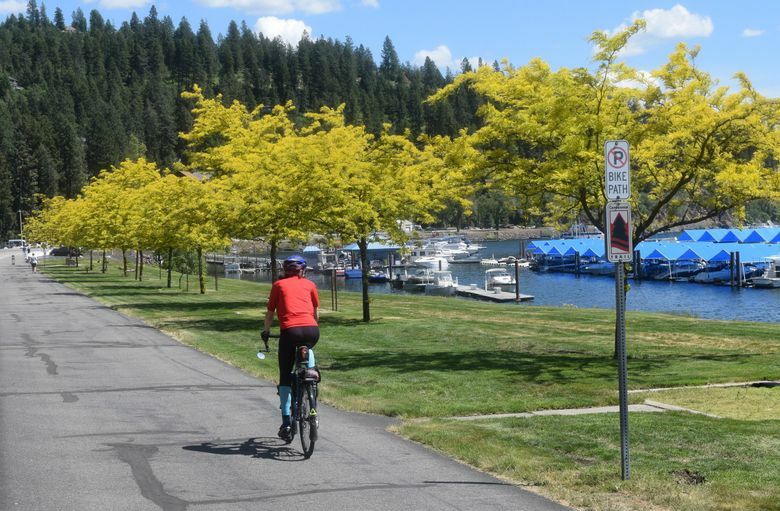 If the North Idaho Centennial Trail was linked with the 72-mile Trail of the Coeur d’Alenes, a path well into the three digits would beckon long-distance cyclists as well as locals. As it stands, some enterprising locals could earn some cash transporting cyclists through that 20-mile gap. 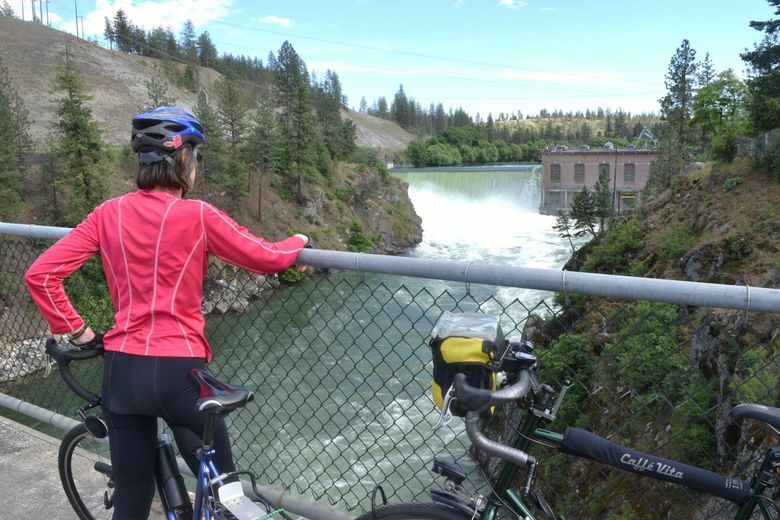 Whether you tackle the entire 60 miles from Nine Mile Falls to Higgins Point, enjoy an easier 38-mile ride linking the downtown parks of Spokane and Coeur d’Alene, or just want to explore the wilder river trail west of Spokane or gentle lake trail by Coeur d’Alene, you will find warm, dry Inland Empire waterfront cycling worth the trip. This post was updated June 25 at 12:40 pm to clarify the name of Spokane’s downtown park. It is Riverfront Park, not Riverside Park. Bowl and Pitcher Campground at Riverside State Park is accessed from the Aubrey L. White Parkway in northwest Spokane. Reservations (advised) at http://parks.state.wa.us/573/Riverside or 888-226-7688. Other local campgrounds can be found at Nine Mile Recreation Area and Lake Spokane. Camping options near Coeur d’Alene include Wolf Lodge Campground and Camp Coeur d’Alene Campground. Bill Thorness Bill Thorness is the author of "Cycling the Pacific Coast" and "Biking Puget Sound," both from Mountaineers Books.